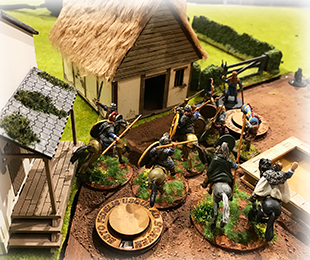 Saga is a Dark Ages skirmish system that works well for group play and can accommodate any number of figures. 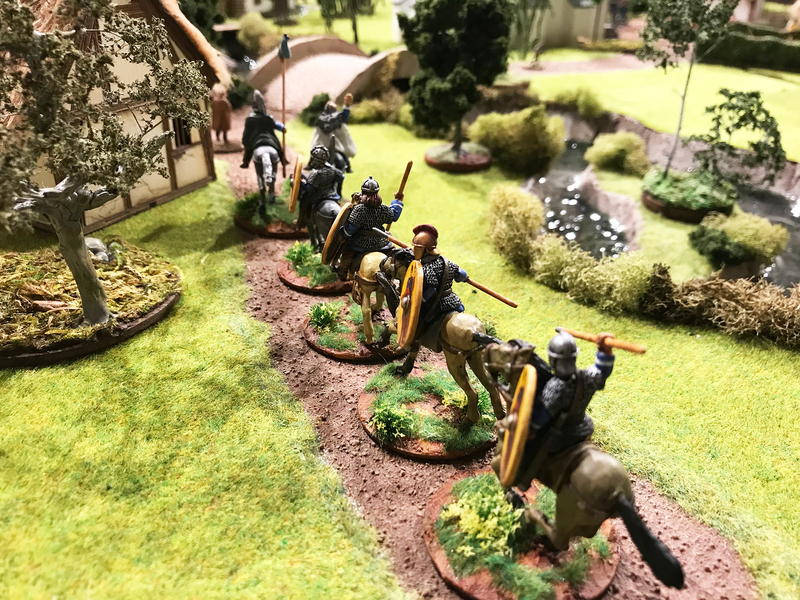 Each side has a warlord plus several units that can range from a four man cavalry section to a twelve figure archery unit. 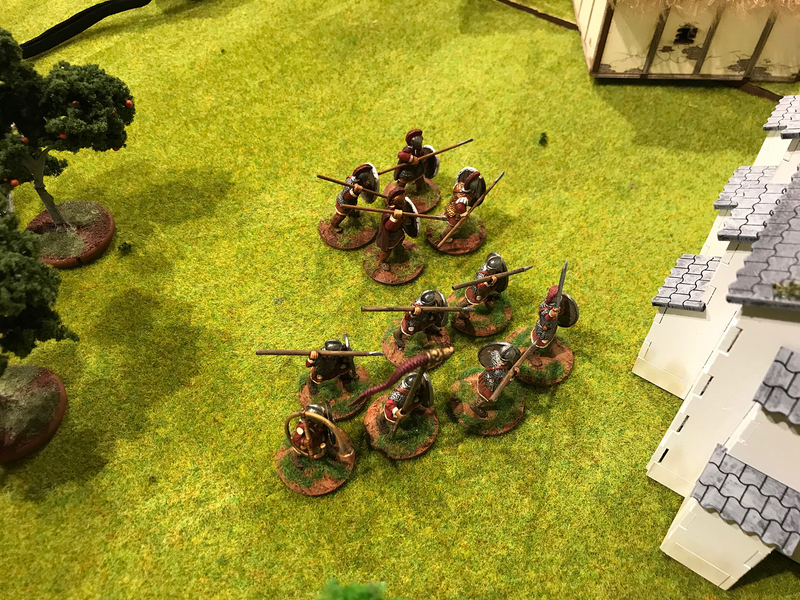 Each unit is rated for its movement, attack, and armor values which influence the combat system. 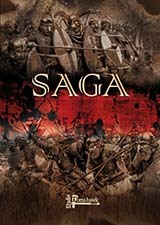 The heart of the system, however, are the "Saga" dice, which have unique symbols on them for each faction. 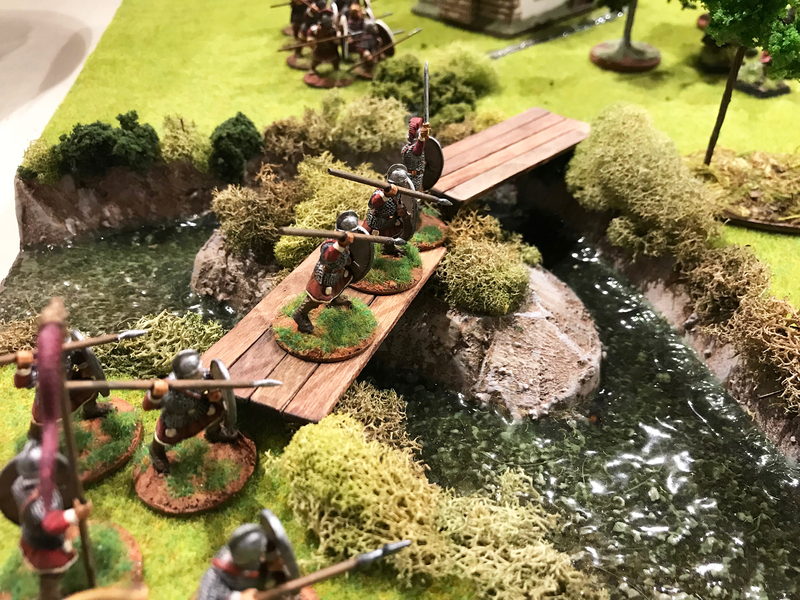 Using the symbols is a game unto itself, allowing units to move, gain extra attacks, rally, or use their factions special skills. 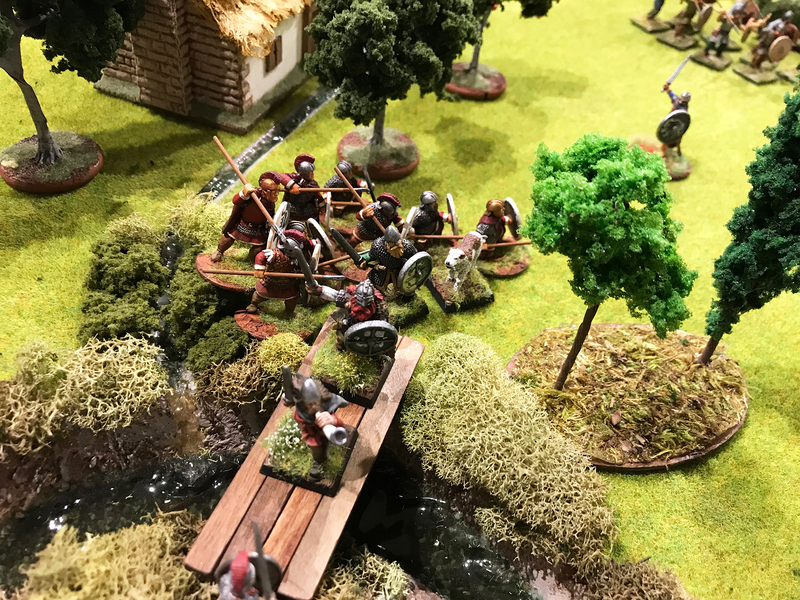 Outside of how to use these special dice, however, is a very fast paced game that has systems easily understood by new and veteran gamers. 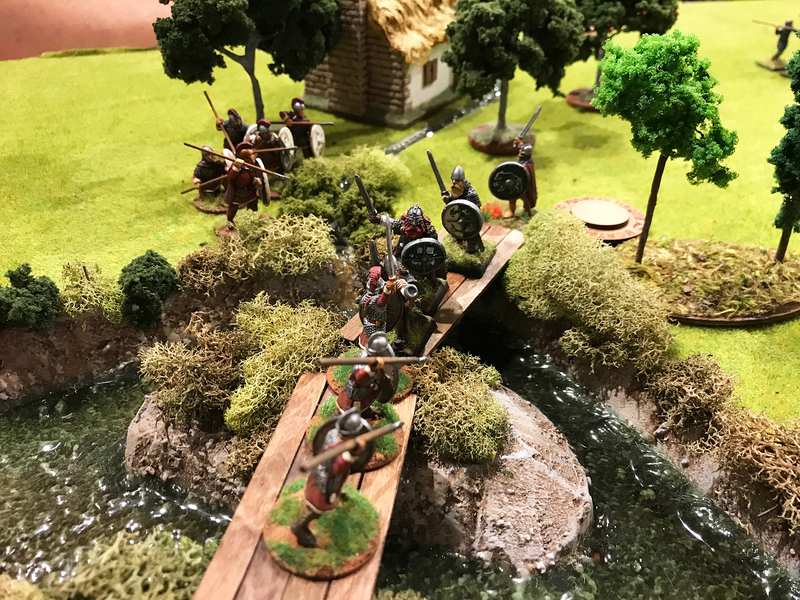 You can usually complete a four player game of Saga with up to 30 figures a side in a little under two hours, making it ideal for group games. 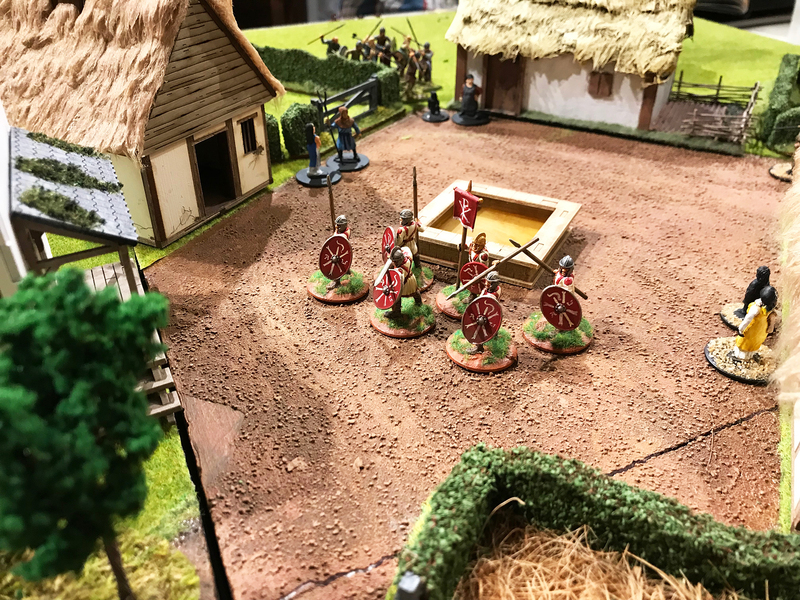 While we've used Saxons before several times, this would be the first chance to see how Rob's new Romans would do with Saga. 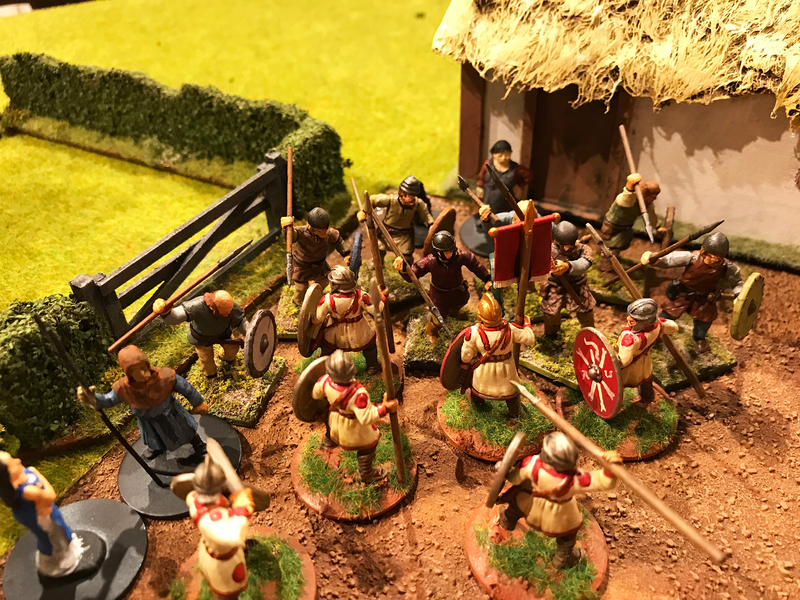 The scenario was a Saxon raid on Roman held Belgium with the intent of killing everything in sight that supports the Roman supply system for that area. 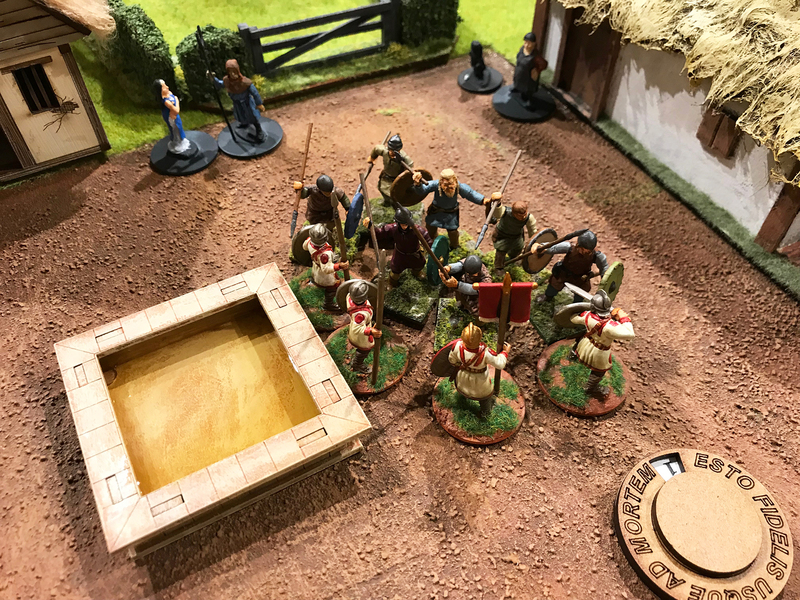 This was a four player game, but each side only rolled one handful of Saga dice and used one battleboard, which was a change from some of our previous games. 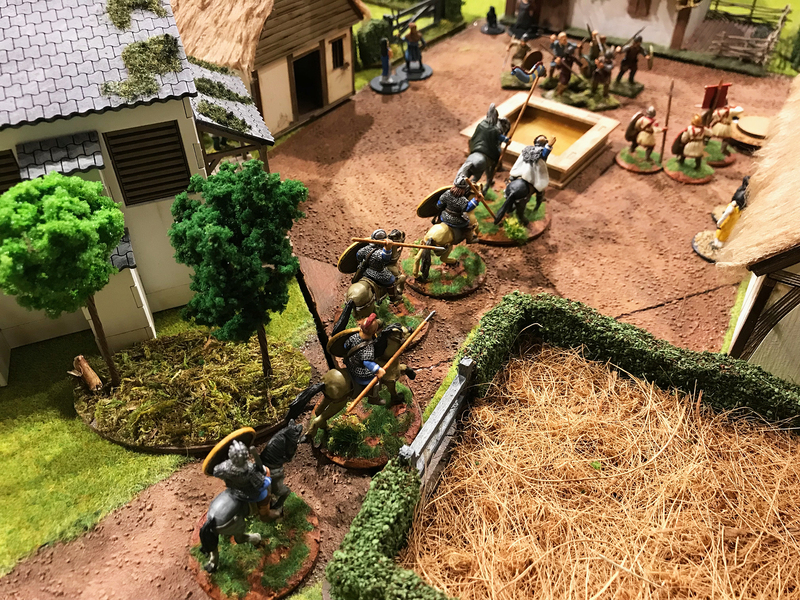 Each player had a few units, with the Romans having two groups of cavalry, which were the heavy hitters for the scenario. 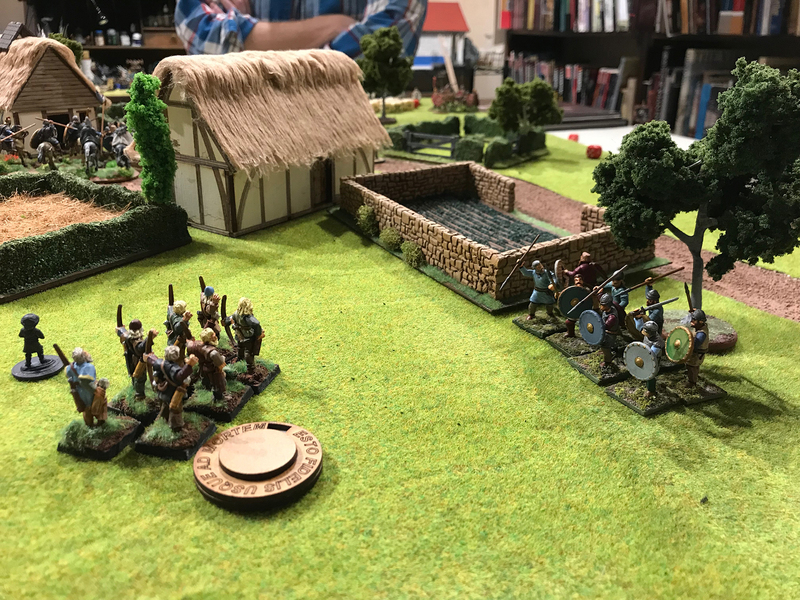 Both sides moved quickly towards the center of the village, but the Saxons were delayed by a Roman light ballista in a field and Roman infantry taking out a Saxon unit with little damage to themselves. 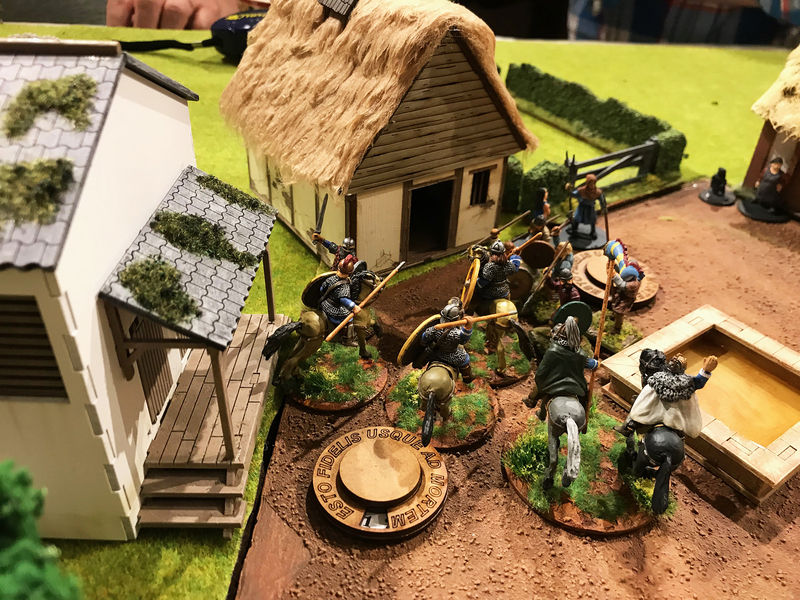 The Saxons did get to the center of the village and caused some havoc, but the real heroes were the Roman levy in the village that lasted several turns longer than they should have! 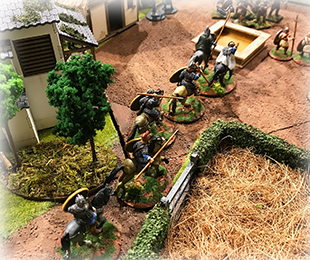 The Roman cavalry had just enough time to get to the village and save the remaining civilians so that the game ended as a Roman victory, but it was very close. 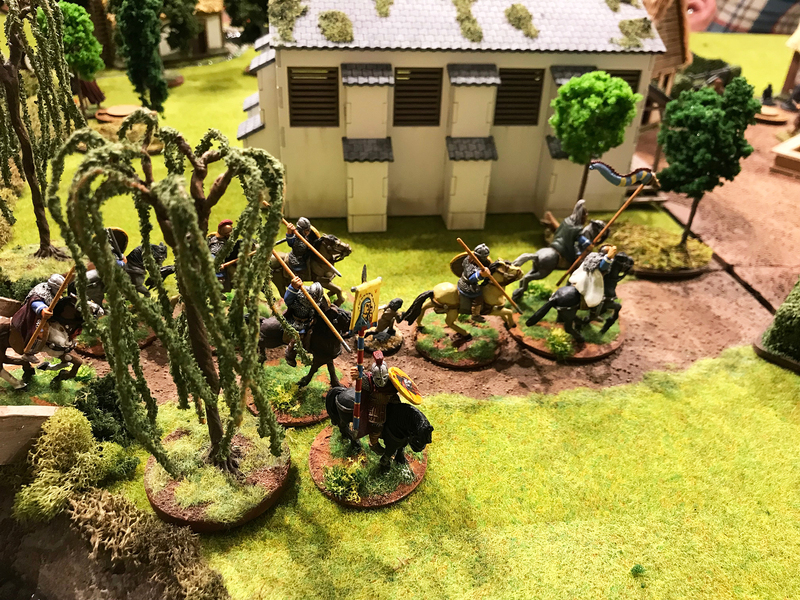 The entire game took around 2 1/2 hours, which was pretty good for playing 9 turns with four players.